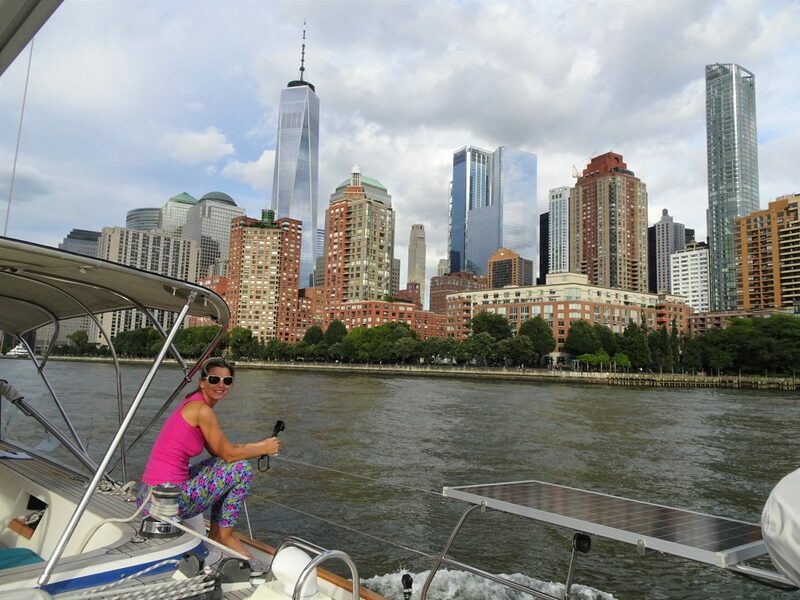 Thursday 27 September: Leaving Huntington, motoring around Manhattan and unplanned anchor behind Sandy Hook. It’s time to move from Huntington today, after 10 days on the mooring buoy. Heading for Chesapeake Bay, which will be our last destination area in USA this season. And we will stop at Cape May on the way. We timed our departure with the tides and the marine traffic restrictions on East River, we shall see how good our planning was when we arrive at Hells Gate! Bright morning today, what a difference few rays of sunshine make! This harbor looks very pretty when the sun is over it. After breakfast we quickly dinghy ashore to settle the bill and briefly meet Eric, who arranged the mooring buoy for us. Then we prepare the decks, and are ready to go after a short drone flight over the harbour. Good wind as we head out into Long Island Sound, 9-11kts and sails are out soon after we exit the channel. We are not breaking any speed record, doing only 5kts speed, but it’s nice to have a bit of peace to match the sunny day. Just 30 minutes later, as we turn west and downwind towards NYC, the engine has to come on. We need to be moving faster to make it for the tide change. As we get closer to Manhattan, we call US Coast Guard to announce ourselves before entering East River. We make several calls in fact, both VHF and phone. They don’t seem to know if we need to check in. At least we did our bit. Due to the Security Council meeting in the UN, the usual channel on the West side of Roosevelt Island is banned from entry. All traffic must transit the narrow east side. This means we need the Roosevelt Island bridge raised… even then then it’s only 95ft clearance for our 85ft mast. From 5 miles out we try to call Roosevelt Bridge control, but not successful. And even by Hell Gate Bridge we still haven’t had contact with the lifting bridge. When we do manage to reach the bridge controller on the phone, he has a strong Latino accent and clearly hardly understands English. But we do manage to understand the bridge will lift shortly, after they clear the traffic. 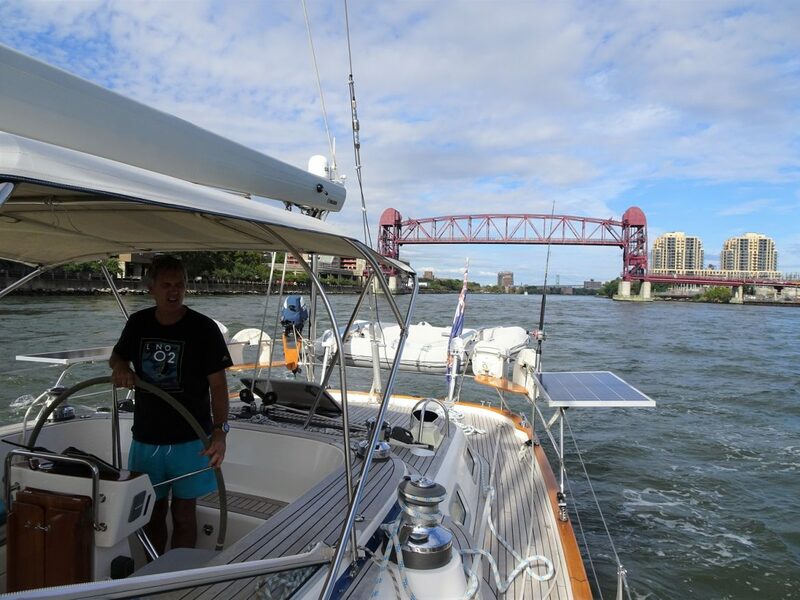 And there we are, very close to Roosevelt Bridge, in 5 kts of current, which is swirling us all over the place while Glen tries to keep control, at a safe distance from the bridge itself. We do make few 360 turns waiting for the lift. The first time we spin around and start to head back up-tide Glen has a fright: he sees the SOG at 3 knots but then realizes that’s actually 3 knots going backwards!! It takes almost full throttle to get us moving away from the closed bridge which we are getting sucked towards! Eventually we see the bridge go up. As we pass under it, it looks very low, and our legs are a bit shaky. That 10ft clearance between the top of our mast antennas and this bridge looks very close from below! All good in the end, and once we are on the other side, and get rolled by the wash from a speeding ferry, we realize that large wake right under the bridge may have resulted in a change of underpants for the skipper! Phew … glad that part is over. 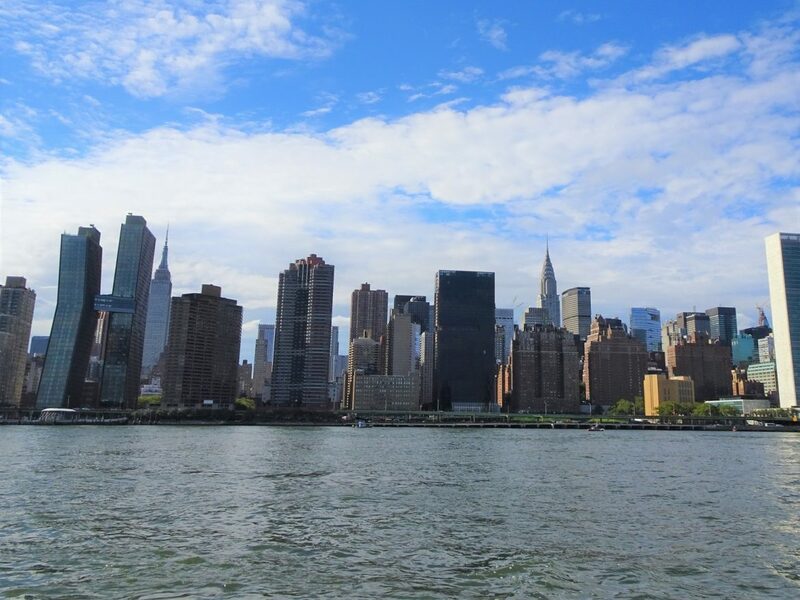 We then pass under the other three bridges (Williamsburg, Manhattan and Brooklyn), admiring Manhattan skyline in the bright sun. It’s quite a sight. At Manhattan’s tip we steer towards the Statue of Liberty, and then up Hudson River, where the tide is 2 kts against us. After a bit of sightseeing here, we turn around and motor back out, along New Jersey’s shore this time. We haven’t seen it from up close back in June, so now is a good opportunity. Unfortunately the sun is gone now and dark clouds are gathering above us. As we motor out and towards the channel, we check weather forecast again. And surprisingly, two models now show there will be 20kts of wind bang on our nose going down the New Jersey Coast tonight. Which, in the Atlantic swell, will not be fun. And from previous experience, we know that likely means 30kts gusts. We’ve had that once from Gibraltar to Morocco, no need to repeat the experience. So change of plans. We will anchor for the night behind Sandy Hook, roughly 10 nm from the Statue of Liberty on the north New Jersey coast. Wind against tide makes the sea very choppy, and waves are spraying our decks all the way to the bimini top. Then we get to safety behind Sandy Hook. Hm, it would have been nice to have had the planned night sail, for Alex to experience that. We drop the anchor just as it is getting dark. It seems to be a peaceful anchorage. Soon we realize we are right under the flight path for JFK. But we are happy not to be rocked around. And now that we are still, we can have our main meal for the day: lunch at dinner time, again. As we eat in the fresh air in the cockpit, rain starts and wind picks up and we are glad we don’t have to carry on down the coast in these conditions. Quiet and uneventful rest of the evening, with a bit of admin on the laptop, and making travel arrangements for a trip to Canada for Thanks Giving, to visit Glen’s cousins in Toronto. As we retire to bed the wind is howling in the rigging, 25+knot gusts now, and during the night very heavy rain as the front passes over. A nice time to be in a snug anchorage.